Our study investigated the effect of lymph node (LN) noncompliance on the long-term prognosis of patients after laparoscopic total gastrectomy (LTG) and explored the risk factors of LN noncompliance. 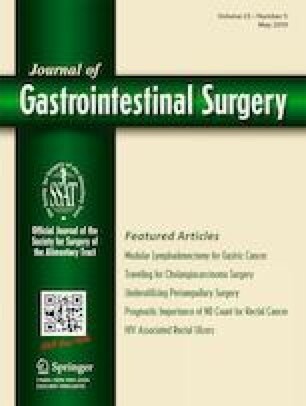 The clinicopathological data of gastric cancer (GC) patients who underwent LTG with D2 lymphadenectomy from June 2007 to December 2013 were prospectively collected and retrospectively analyzed. The effects of LN noncompliance on the long-term prognosis of patients with GC after LTG were explored. The overall LN noncompliance rate was 51.9%. 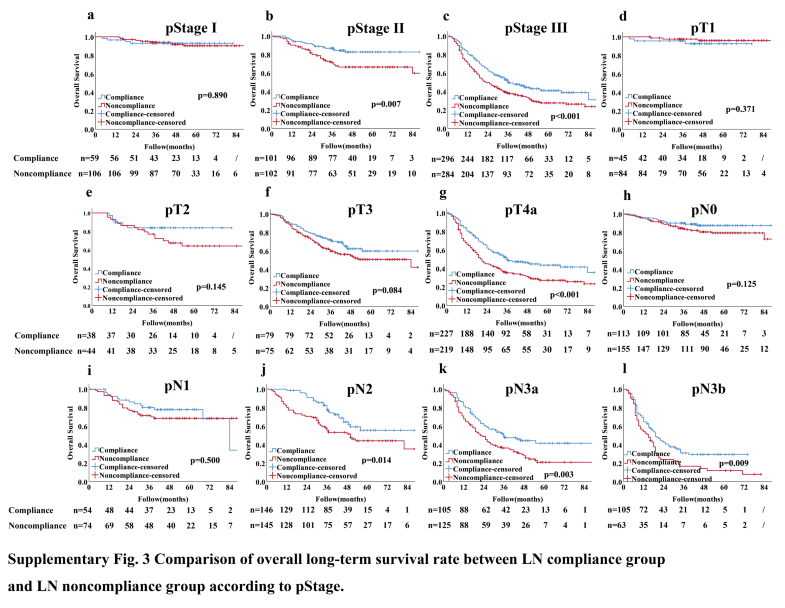 The survival rate of patients after LTG with LN compliance was significantly superior to that of patients with LN noncompliance (p = 0.013). The stratified analysis of TNM stage indicated that there was no difference between the OS of stage I patients with LN compliance and those with LN noncompliance; OS of stage II/III patients with LN compliance was significantly better than that of those with LN noncompliance. 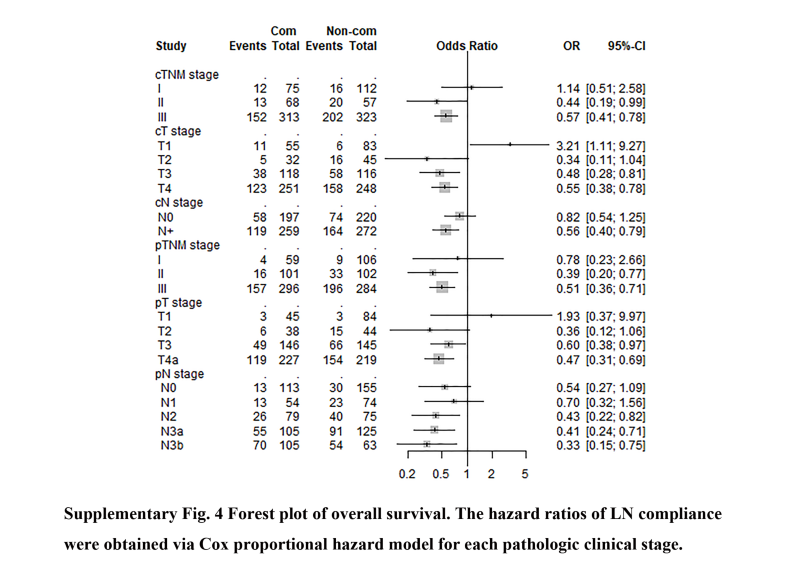 Cox regression analyses showed that LN noncompliance was an independent risk factor for OS. Logistic regression analysis showed that high BMI (≥ 25 kg/m2) was an independent risk factor for preoperative prediction of LN noncompliance in cStage II/III patients. Patients with a high BMI were more likely to have LN noncompliance during surgery, especially during the dissections of #6, #8a, and #12a LN stations. LN noncompliance was an independent risk factor for poor prognosis in patients with advanced gastric cancer (AGC) after LTG. Patients with high BMI were more likely to have LN noncompliance, especially during the dissections of #6, #8a, and #12a LN stations. LN tracing was recommended for these patients to reduce the rate of LN noncompliance. The online version of this article ( https://doi.org/10.1007/s11605-019-04199-9) contains supplementary material, which is available to authorized users. GTL, CMH, and CHZ conceived and designed the study. QYC, PL, JWX, JBW, and JXL performed the study. GTL and QYC analyzed the data. ZNH, LLC, ML, RHT, and JLL contributed the reagents/materials/analysis tools. GTL wrote the manuscript. All authors read and approved the final manuscript. This work was supported by scientific and technological innovation joint capital projects of Fujian Province, China (No.2016Y9031). Minimally invasive medical center of Fujian Province (No. 171). National key clinical specialty discipline construction program of China (No. 649).